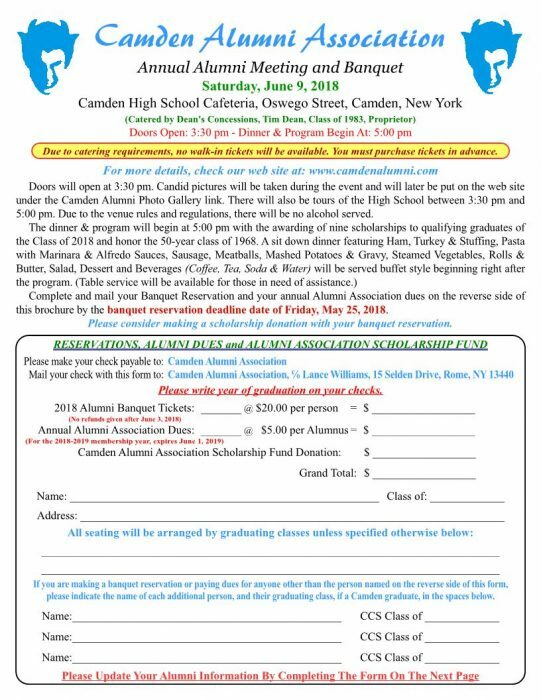 Just a tad early this year, but the reservation form for the Annual Alumni Meeting & Banquet has been posted online and available for downloading. You can download your copy today at this link: Annual Banquet Reservation Form. If you have an email address on file, you will be receiving an email for downloading this invite in a couple of weeks (Soon after April 10th to meet the terms in our by-laws). If you are a currently active dues paying member with no email address on file, you will get a copy of the printed banquet information in the mail via first class mail. If you are not an active dues paying member, but you are a member of a class of 1968 or older, or the classes of 1973, 1978, 1983, 1988, 1993, 1998, 2003 or 2008 and have a valid USPS mailing address on file with us and do not have an email address, you will get a copy of the printed banquet invitation in the mail via non-profit standard mail (reduced postage rates).